Fairfax, California is a groovy little town West of San Anselmo and the Marin County seat, San Rafael. Known for it’s liberal politics, redwoods and oaks, bicyclists (who think they are on the Tour de France) and its diverse and colorful population, often seen wearing tie-dyed t-shirts and burning incense. Fairfax is also home to the most night life in Marin County, with quite the variety of small night clubs like 19 Broadway, Peri’s, Café Amsterdam (which is being replaced by a revived Sleeping Lady Café) and don’t forget about the Fairfax Theater. Before you go and check out all this night life, you are probably going to want to catch a meal at one of the many restaurants like Iron Springs Pub and Brewery, Fradelizio’s, Ghiringelli’s Pizzeria, Barefoot Café, Grilly’s, Pancho Villa’s, Siam Lotus, M&G Burgers, Chad’s Grill and Garden Cafe or Deer Park Villa. During the day there are some unique shops to peruse like Lola’s Depot, Magpie and Yeah Baby (all three are clothing and novelty stores), Purple Haze Smoke Shop, Sherman’s General Store, The Potting Shed, Fat Angel Bakery, Culture Shock, Frog’s Spa, Revolution 9, Tibet Moon and, of course, there is much more. In addition to night life, restaurants and shopping, Fairfax also offers many community events throughout the year like the Fairfax Farmer’s Market (which is really more like an event than a market), the Annual Fairfax Town Picnic and Barbecue, the Annual Fairfax Festival and EcoFest, the Annual Easter Egg Hunt in Bolinas Park, the Annual Good Festival, and there is usually something going on Earth Day as well. 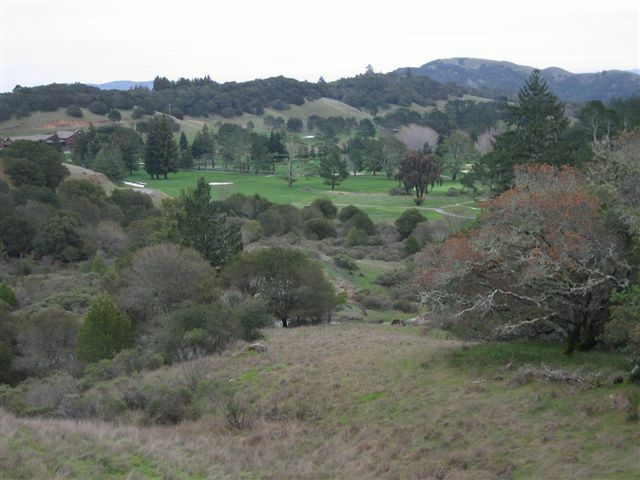 And if that isn’t enough, Fairfax even offers one of California’s finest golf clubs, the Meadow Club. Let’s face it, Fairfax is very unique. In fact, they have a bumper sticker that reads “Only in Fairfax” because it just has it’s own special feel and appeal. There are sites dedicated to photography of it and even Wikipedia weighs in with some pretty interesting stuff. In the mid-1960s, a softball game between Jefferson Airplane and the Grateful Dead took place at Central Field, a public downtown baseball field. Fairfax’s first constable and Chief of Police, Andy Peri, served from 1925 until his death in 1959. He used to stand at the Fairfax train platform with a stern look and shake his head “no” at anyone who looked scruffy, had a beard, or might be “undesirable”. (Provided by John & Annette van der Slice). Some silent films, such as Broncho Billy shorts, were filmed in Fairfax. Irving Berlin used to serenade from a treetop piano at Pastori’s Hotel, formerly Bird’s Nest Glen, the home of Lord Charles Snowden Fairfax, and later known as the Marin Town & Country Club. During prohibition, a rider of the Fairfax Inclined Railway could provide a certain amount of money to the driver and would be dropped off at Berry Trail, a path where lots of speakeasies were located. The speakeasies are now all homes with beautiful views, but at the time, were impossible to see from downtown. At one time Fairfax was a common hideout for Mafia on the lam. Mayberry on Acid Is a 4min. short that captures the spirit of Fairfax. It is the winner of the Fairfax Film Festival Short Documentary Film Challenge 2007. Needless to say Fairfax leaves quite an impression. For even more information about this area visit my website or contact me directly.